Powder Dreams | Features | Kids VT - small people, big ideas! The sight of skis lying on fresh powder acts like a magnet for the 10 elementary school students who climb out of a minivan at the Burlington Country Club on a sunny February afternoon. The children — who have arrived at their weekly cross-country, or Nordic, ski lessons — don't waste a second getting their gear on. "It's my favorite thing!" declares Dependra, a student at the Sustainability Academy at Lawrence Barnes in Burlington. He moved to Vermont from Nepal about a year ago with his family. Smiling, Dependra plops himself down in the snowy parking lot and immediately sets to work (with some adult help) lacing his ski boots. All the kids are eager. The sun is shining on several inches of fresh powder, and today's lesson will teach them how to handle hills. While the sight of kids skiing isn't remarkable in Vermont, these skiers are newcomers to the sport. Their outing has been made possible by the Catamount Trail Association's Ski Cubs program. In its inaugural year, Ski Cubs is reaching out to children of recent immigrants and others who have never had access to cross-country trails or downhill slopes. The CTA, a nonprofit with the mission of maintaining the public-access ski trail that runs the length of Vermont, has now become the go-to ski resource for 40 kids. Some are American-born children; other youngsters resettled here from countries such as Ethiopia, Nepal and Kenya. Their teacher is Emily Wheeler, a 2007 Middlebury College graduate who spent two years on that school's Nordic ski team. She returned to Vermont after working with the Food Project in Massachusetts, which gets teens involved in farming and sustainable-food systems. Today, Wheeler is directing the children to the top of the country club's steep sledding hill, the biggest ski slope these students have yet seen. She gives them a quick lesson on how to wedge their skis to descend a slope with control. For the most part, the kids are game and fly down the hill, tumbling over in the soft powder with happy shrieks. They quickly realize the hardest part is getting back to the top, but Wheeler and several adult volunteers patiently provide tips on how to make it up the hill without sliding backward. It's clear from their enthusiasm that Dependra and his classmates from Barnes have fallen under the spell of cross-country skiing. "We wanted something to reach out to kids who normally wouldn't get on skis," notes Jim Fredericks, executive director of the CTA, in an interview in the organization's Burlington office. "If you aren't exposed to something, you don't know it's there." The first step for the CTA was finding $15,000 to cover the cost of 30 pairs of children's skis and poles — plus even more boots to offer the right sizes for the students — and other expenses, such as insurance, Fredericks says. CTA raised the money through a grant from MVP Health Care, and a facilities grant from the state of Vermont and two private donations, Fredericks notes. Ski manu —facturer Rossignol, for which Fredericks previously served as Nordic team director, offered to sell skis to the CTA at cost. Once CTA had the cash and the equipment, it needed someone to run the program. When Wheeler called to express interest, Fredericks knew they'd found the right person for the job. "I've known Emily from when she was knee high to a grasshopper," he says. Wheeler recruited Burlington kids from Barnes, Hunt Middle School, the Northgate Apartments' after-school program and the Boys & Girls Clubs in both Burlington and Winooski to ski on weekday afternoons. How did she convince kids to sign up for Ski Cubs? Wheeler says she toted her skis to the schools and played the kids a YouTube video about an Ethiopian cross-country skier, which she said demonstrated that anyone, anywhere, could take up skiing. But Vermont isn't just anywhere. Burlington receives an annual average of 80 inches of snow, making it the 20th snowiest location in the U.S., according to statistics compiled by the National Climatic Data Center. Taking up a snow sport might be considered an essential skill here. After all, Vermont children who don't have the clothing, ability or gear to take up a snow sport can find physical-fitness options limited during the long winter months. Kathy Olwell, the after-school coordinator for Hunt Middle School, says the school first reached out to English-language learners for that reason. Her hope is that the Ski Cubs program will open doors for the students, many of whom "have come from Africa and Asia, where it isn't real cold. They don't want to go out in it because it's so unknown to them," she says. "They don't know that, with correct clothing, you can go out in the snow and get warm. For them to know they can do it is so important." Fredericks and Wheeler say Ski Cubs is about more than just getting kids out to have fun in the snow. Another goal is to fight childhood obesity, something First Lady Michelle Obama has pledged to do on a national level with her Let's Move program. Fredericks and Wheeler see the Ski Cubs as a way to reach out to some of Burlington's most at-risk kids. "Kids in lower economic groups suffer the most from this epidemic," Fredericks notes. "We're [playing] a small part" in the fight. But can a two-month program really have a life-changing impact on kids? Absolutely, says Mark Redmond, executive director of Spectrum Youth & Family Services. While Spectrum isn't part of the Ski Cubs, it participated for several years in Burton Snowboard's Chill program, which aims to instruct underserved kids in that sport. "One of the big challenges is expanding their horizons, especially to get those kids out and seeing there is a whole other world," Redmond notes. Such programs may "spur them on to say, 'This is why you go to school every day, this is why you don't drop out,'" he says. "Part of our work is trying to set kids' sights higher." Wheeler says she did a quick survey when the children joined Ski Cubs, asking them questions about their skiing history and TV-viewing habits. A number of them said they watch more than five hours of television per day, which points to the need for programs such as Ski Cubs, she suggests. "If we can get them on skis, to look at the trees, to look at animal tracks, and maybe on the Catamount Trail they see moose tracks, it could be something they'll talk about for years to come," Fredericks adds. But it's unclear whether more children will be able to take advantage of the program next winter. The CTA is dependent on AmeriCorps for a coordinator to run the program, and funding for AmeriCorps is uncertain, Fredericks says. Whether or not the program continues beyond 2011, the CTA is arming kids with the information and skills they'll need to ski without Ski Cubs' support. Fredericks says the CTA will end the season by telling the children how to find inexpensive gear at ski swaps. Wheeler notes the students will take away the knowledge that skiing is available almost anywhere there's snow. She's taking them to several no-fee Nordic skiing spots favored by Burlington-area residents: the Intervale, Red Rocks and the Burlington Country Club. "Low-income kids don't get to enjoy so many of the things that a middle-class family does in Vermont, and skiing is one of those things," notes Spectrum's Redmond. "It's an esteem builder. It's more than a fun day." Visiting the Alpine and Nordic ski areas at Bolton Valley offers a tale of two lodges. The Alpine lodge, parked up the hill from the Nordic center, is packed every weekend with parents and kids clomping around in heavy ski boots. At lunchtime, it's a challenge to find a spot to sit down. Meanwhile, the Nordic center nearly always has a calm vibe and space at its tables to sit down and relax after a cross-country ski. The ratio at Bolton of children taking Nordic ski lessons to kids learning Alpine skiing and snowboarding is "1 to 100, easily," notes Ed Gill, director of skiing and riding. "That's without exaggeration." Why is that? Gill said it's likely a combination of children seeing flashy snowboard tricks on television or on the slopes and wanting to emulate them, as well as parents being skiers and riders and wanting their children to learn the same skills. That's backed by data from SnowSports Industries America (SIA), the trade association for winter sports such as snowboarding and Alpine and Nordic skiing. 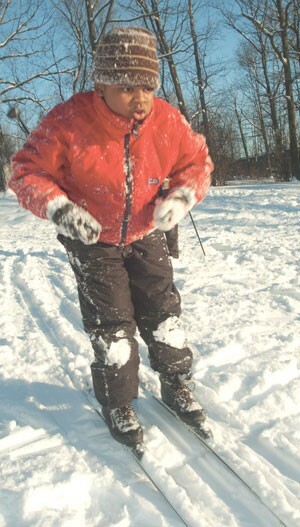 A recent study from the group found that 293,000 American youths tried cross-country skiing in 2009. By comparison, more than 3.5 million children either Alpine skied or snowboarded during the same year. The study counted any child who engaged in the sport more than twice in the calendar year. But that trend might be changing, according to SIA. The number of kids skiing and snowboarding declined 28 percent and 24 percent, respectively, in 2009, while Nordic skiing saw a 66 percent jump in children trying the sport, the study found. The economic realities of the different snow sports may be one reason behind the increased interest in Nordic skiing. A child can be completely equipped with cross-country gear for about $200, compared with twice that for Alpine skiing. 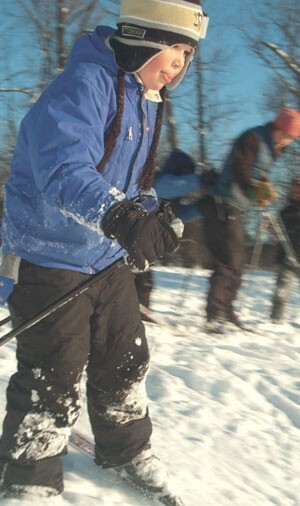 And Nordic skiing is available at no cost at many spots (such as in Burlington's Intervale), while cross-country ski passes at resorts can cost less than half of an Alpine pass. It might be tough to fight the thrill-seeking nature of kids, notes Jim Fredericks, the executive director of the Catamount Trail Association. But, he adds, after Alpine skiing as a kid, he tried cross-country in college and found Nordic racing had thrills of its own. 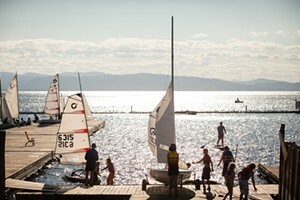 "When you're on skinny skis going 40 miles per hour," Fredericks notes, "it's extremely exciting." Aimee Picchi is a freelance writer whose work has appeared in the Boston Globe, Aol's DailyFinance and Seven Days. Before moving to Burlington with her husband and two children, she was a staff reporter at Bloomberg News in New York."